Hampton Beach, NH | Where would you rather be? Nice of you to come visit the beach. Relax. Kick off your shoes off and get ready to get some sand between your toes. New Hampshire's Hampton Beach has just what you need to enjoy doing just what you want and deserve: sitting on the beach, enjoying the nightlife, eating some great New England food - however it is you best enjoy your summer vacation. Hampton Beach is located in Rockingham County, just over the Massachusetts border and not much further from Maine. There is not much coast in New Hampshire and the Hampton Beach summer resort community is definitely the most heavily visited beach in the state. Here you will find a boardwalk, the world famous Hampton Beach Casino Ballroom and quite a number of businesses that are ready to help you enjoy a fun visit. Since your thinking vacation, let's get right into that mindset and let us ask "what can we help you with?" It is also home the Hampton Beach Seafood Festival. Started in 1988 by the Hampton Area Chamber of Commerce businesses, they thought a seafood festival would be good for visitors and businesses alike. They could promote local restaurants and offer people a great sampling of New England seafood. 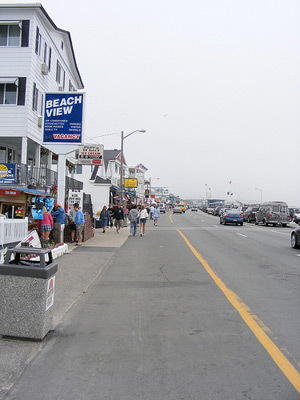 While the first few festivals were not held in town, it quickly changed and settled in to being held in the center of Hampton Beach. The date was also fixed with the change in location, the weekend after Labor Day, and a tradition of closing off Ocean Boulevard to create a large pedestrian area. The festival is now a huge event with over 50 restaurants participating, arts and crafts booths, local merchants offering sidewalk sales, and a lot of live entertainment. Hampton Beach Parking - it’s a mess, but you need to put that car somewhere.